Constructive Rest Position, a powerful practice for anyone with spinal discomfort. by Donna Farhi, co-author of Pathways to a Centered Body: Gentle Yoga Therapy for Core Stability, Healing Back Pain, and Moving with Ease. A recent collation of several back pain studies in America revealed that 8 out of every 10 Americans will have back problems at some point during their lifetimes, yet only one in ten people find out the primary cause of their pain. A further 54 percent of Americans who experience low back pain spend the majority of their workday sitting, a position that puts tremendous weight load pressures onto the intervertebral discs. Not so coincidentally, sitting for long hours in a chair also causes chronic tightness in the deep core muscles of the body. Here in New Zealand, 59% of those complaining of chronic pain locate that pain in the lower back. So, it’s not surprising that many of the people who come to our Yoga classes arrive with preexisting issues in their backs. What are some of the most common warning signals that can help us to identify those that may be having issues with their lower backs? And what are some of the simplest things we can do in class that can make a real difference to relieving and addressing the root cause of back pain? We’ve all been there. You ask your students to lie down with their legs extended on the floor, and then, without being guided to do so, throughout the room many people will bend their knees. If it’s the end of class and you are preparing for relaxation these will be same people who invariably need a bolster placed under their knees. Why? Because when they straighten their legs, they feel one or a combination of many symptoms such as pain around the sacroiliac joints, discomfort in the lumbar spine, or nerve sensations that can travel into the legs and feet. Sometimes this discomfort is always on one side, and sometimes it’s on both sides of the back. Intuitively, people know that bending the knees often alleviates their woes. To understand why bending the knees so often releases pressure in the back you have to know a little about the deepest core abdominal muscle. We usually think of the abdomen as the front of the body, but the deepest abdominal muscles actually lie in the back of the abdominal wall right next to the lumbar spine. Called the psoas muscles, (pronounced so-az with a silent p), psoas major is approximately 41 centimeters long and is a thick triangular-shaped muscle that connects the spine to the legs. The psoas major is subdivided into two parts. The superficial portion arises from the sides of the 12th thoracic and 1st-5 lumbar vertebrae, as well as the 1st-4th intervertebral disks. 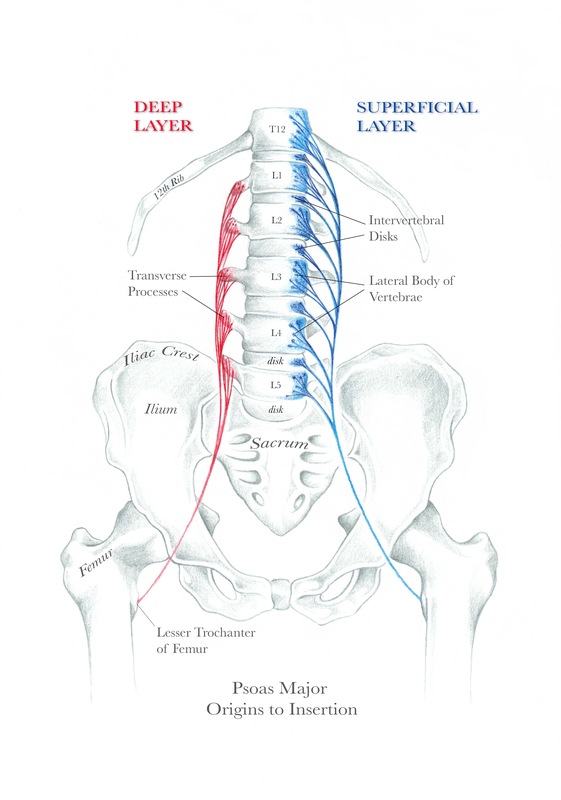 The deep portion arises from the transverse processes of the 1st-5th lumbar vertebrae. The psoas major journeys from its origin on the spine diagonally forward and laterally over the pubic bone and then dives backwards to attach to the inside of the femur by a shared tendinous insertion with the iliacus. The psoas muscles used to be classified by anatomists as the primary mover for hip flexion (e.g. in walking), but more recent research reveals its primary function as a stabilizer of the lumbar spine. Think of your psoas muscles as two industrial-strength columns girding the sides of your lumbar spine, and you get a pretty good idea of how important these muscles are to spinal stability. Which is why, when things go wrong in these deep core muscles, a lot of other things go wrong. 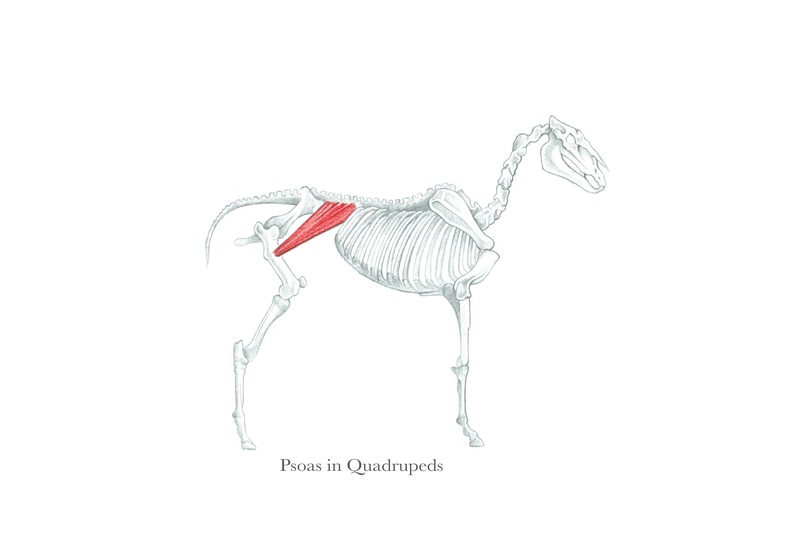 In most quadrupeds, the psoas major does not touch the pelvis but connects directly from the spine to the femur. Our evolution to upright standing has put a very different stress on the psoas, requiring it to bend around the pelvis before detouring back to the femur. Thus the psoas is already under considerable tension just in the simple act of standing or lying down with the legs straight. When the psoas is chronically tight it most commonly tends to pull the lower back and pelvis into anterior rotation (hyperlordosis) and this is accentuated when the legs are straight. This is one of the reasons why so many people find it uncomfortable to lie on their back with the legs straight, and intuitively know to bend their knees to alleviate their discomfort. Tightness in the psoas can also result in posterior rotation of the pelvis and flexion of the lower back (tucking the tail under and flattening the lumbar curvature), and this can also cause considerable discomfort in standing, lying down, and in movement. This paradoxical effect is explained by the working theory that tightness in the upper fibers of the psoas can contribute to spinal flexion, and tightness in the lower fibers can contribute to spinal extension. When you or your students intuitively bend your knees to take pressure off of a tight psoas, you’re attempting to return to a quadruped position. Here’s where it gets interesting. You can radically increase the benefits of lying with bent knees by learning how to be more precise with the practice. That precision is called Constructive Rest Position– the “go-to” for relaxing, releasing, and balancing the psoas. Constructive Rest Position or CRP is one of the most powerful practices that I use for anyone with spinal discomfort. The careful placement of the legs establishes the skeleton as the primary support so that the deep core muscles can relax and release. The hip bones “plug into” the hip socket, and with the assistance of gravity, allow the whole length of the psoas to release the spine. To lie in CRP, place your feet far enough away from your buttocks that the upper and lower leg bones “rest against each other like cards”. In this position, the rectus femoris (quadriceps) and the rectus abdominis (outer abdominal muscles) will be optimally relaxed. 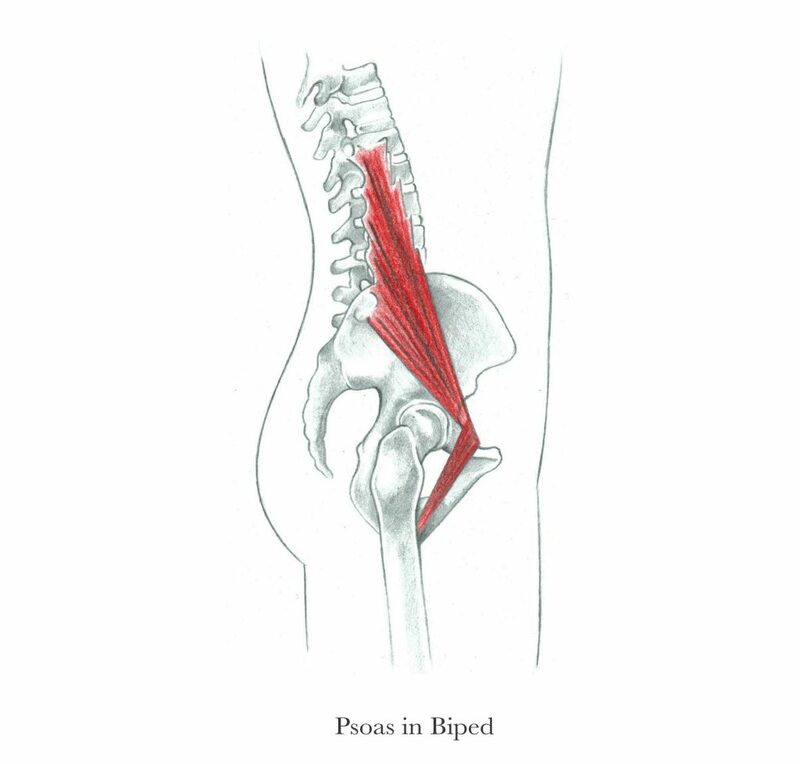 These two muscles are most likely to duplicate the action of the psoas and are often overdeveloped in those with issues in the deep core muscles. If your feet are too close to the buttocks, you will find that your upper thighs are unnecessarily tense and that the weight of your body primarily will be on the ball of your foot. If your feet are too far away from your buttocks, the abdominal muscles will be too engaged and the weight of the body primarily will be in the heel of the foot. When the weight is balanced equally between the ball and heel of the foot, and you have some air space behind the knee, you are approaching the zone of an optimal CRP. Also check that the feet are hip-width apart; if the feet are too wide apart, the knees will fall inward; if the feet are too narrow, the knees will fall outward. Briefly, look down your torso and check that the thighs are in a parallel position and that the weight on your feet is balanced between the inside and the outside of the foot. Last, if you feel discomfort in your neck and it appears that your chin is higher than your forehead; place a folded towel under your neck and head until the forehead is slightly higher than the chin. Use as much towel support as is necessary to feel comfortable but do not use so much support that it causes the head to be raised significantly higher than the neck. Now relax for 5–15 minutes. When you are ready to come out of CRP, roll over to your right side and curl up to sitting. Or better yet, straighten your legs along the floor and notice if you can do so with greater ease. Observe whether there has been a change in the points of contact between your body and the floor. Practicing Constructive Rest Position for 10-15 minutes, 1-2 times a day can give significant relief for back pain sufferers and can contribute to a resolution of back problems. It’s one of the simplest, most effective, and accessible practices you or your students can practice. However, if you or one of your students is suffering from acute back pain, this requires the immediate assistance of a qualified health professional. There are obviously many complex causes of back pain other than tight or unbalanced psoas muscles. However, because the psoas is a key determinate of both the position of the pelvis and spine, releasing and lengthening these muscles can go a long way towards helping to resolve back problems (regardless of their origin). As you become more skillful, you can adapt the practice of CRP with the use of blankets, belts, and blocks to tailor fit the practice for specific spinal conditions. Being able to lie down, sit, stand, and move with ease is one of the many benefits of a balanced Yoga practice. Learning about core body balance and applying intelligent Yoga therapy techniques can pave the way toward Yoga being a nourishing and healing modality for addressing the root causes of back pain. Pathways to a Centered Body: Gentle Yoga Therapy for Core Stability, Healing Back Pain, and Moving with Ease is an extraordinary new approach for realigning your structure with simple, pain-free, and effective Yoga therapy techniques. 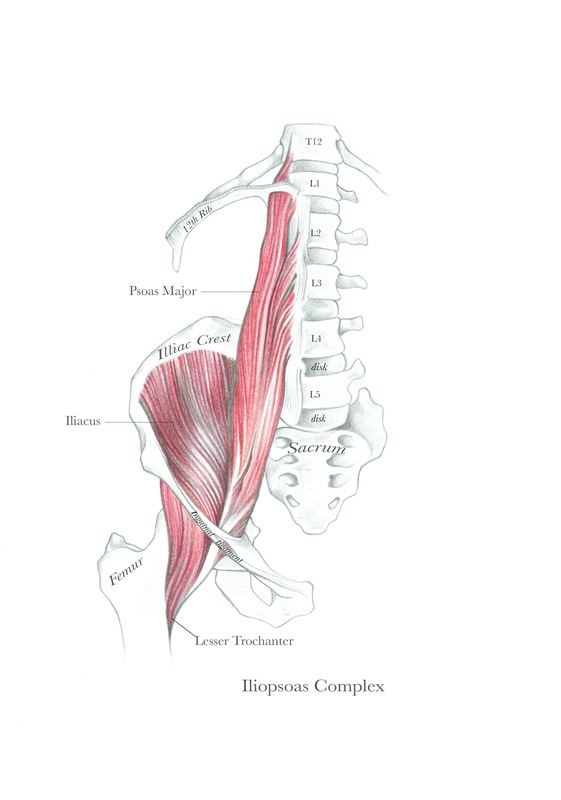 Using easy-to-understand anatomical terms combined with exquisite illustrations, the authors unravel the complexities of the deepest core muscles, the psoas, to reveal its function as an extraordinary unifying structure for the entire body. In a step-by-step protocol, clearly outlined with over 108 colour photographs, you’ll learn how to release, balance, and engage your core muscles, and you’ll learn how to safely improve your flexibility in Yoga practices without compromising pelvic or spinal stability. Donna is the author of four contemporary classics: The Breathing Book, Yoga Mind, Body & Spirit: A Return to Wholeness and Bringing Yoga to Life: The Everyday Practice of Enlightened Living. 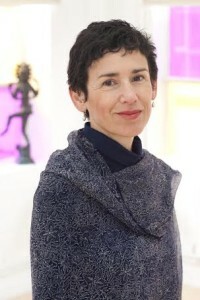 Her fourth book Teaching Yoga: Exploring the Teacher-Student Relationship is a curricular text for teaching trainings worldwide. 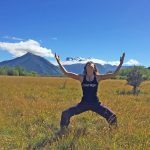 After nearly four decades of practice Donna believes that Yoga is about learning to befriend our self and to be in friendship with others as a means to building greater fellowship with all of humanity. Her fifth book, co-authored with Leila Stuart, Pathways to a Centered Body: Gentle Yoga Therapy for Core Stability, Healing Back Pain and Moving with Ease, will be released in May 2017. American born, Donna now resides in Christchurch, New Zealand on a 30-acre farm with her partner and her horses Santosha and Pavana. Thanks for the useful pieces of advice. I have similar problem with my back. Recently I started to attend the physiotherapy sessions at http://edenphysio.co.nz/ near me in Auckland. I decided to try a traditional Chinese acupuncture medicine. Hope it helps! I do yoga but I have tide muscle on my right leg and if I stand on it for long it painful….